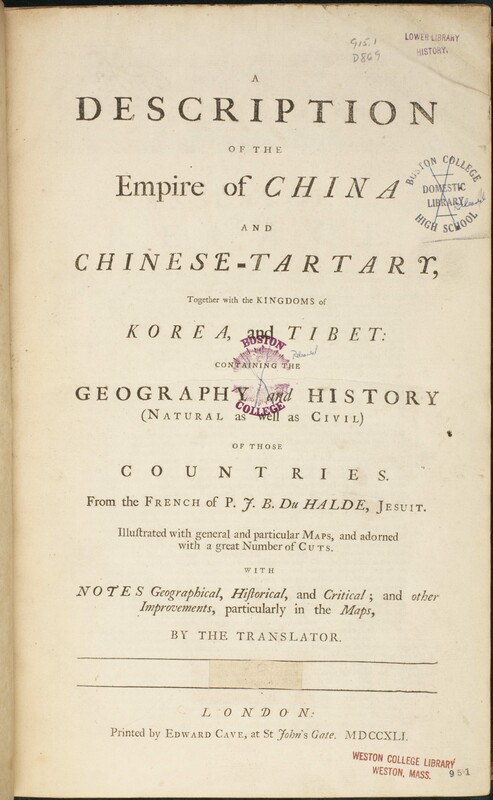 The original work was written in French and its short title was Description géographique, historique, chronologique, politique, et physique de l’empire de la Chine et de la Tartarie chinoise. The first edition was published in Paris in 1735, although a second edition was quickly published at The Hague, the Netherlands, in 1736. The work was very popular and influential. In many ways it was a comprehensive encyclopedia about Chinese fauna, flora, language, customs, politics and geography. The French edition was accompanied by an atlas that had been made by the royal cartographer Jean-Baptiste D’Anville and these two works helped inform readers across the continent of Europe about China. Modern readers will be interested in the contemporary descriptions of these items as well as the manner in which they have been portrayed in the engraved plates. It is interesting to note the religious context within which the English translation was made. There is an image in the French original that shows the famous Jesuit Matteo Ricci alongside his Chinese friend, Paul Xu Guanqi, the equally famous scholar bureaucrat. They are both in Chinese scholar robes, and stand in front of a painting of the Madonna and Child, with a cross on a small table (essentially an altar) behind them. In Europe this image was first published in Kircher’s China Illustrata. It now made its away across the English Channel and in the process lost the painting of the Madonna and Child, presumably for reasons of religious and political difference.